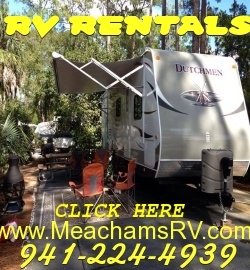 Across the blue waters of Bay Lake, along a white sand crescent beach and sitting on over 750 acres full of shady cypress trees draped with Spanish moss, sits an often overlooked gem of Walt Disney World – the Fort Wilderness Resort and Campground. The parks may be a constant buzz of nonstop action and fun, but here you’ll find a peaceful oasis where you can ride a bike, paddle a canoe, lay in a hammock on the beach, or just enjoy a rocking chair on the porch of Crockett’s tavern while taking in the relaxing atmosphere of a bygone frontier era all amid the beauty of central Florida. Although the Fort Wilderness Campground has long been considered to be one of the “original three” resorts, it actually opened one month after the Contemporary and Polynesian Village resorts, on November 19th, 1971. It was an immediate hit with both locals and Disney travelers alike. In it’s early days, reflective of Walt’s love for trains, it even featured it’s own steam train that transported guests and campers along 3 ½ miles of fields, wilderness and trestles. Over 40 years later the resort is still a favorite among WDW fans for these and so many more reasons. Over the years the campground has seen many changes. More camping loops have been added and the size of the resort has increased from its original 231 campsites to its current 784, and as its popularity grew 409 “home away from home” cabins have been added. The newest and most recent renovations include wider campsites, WiFi access, a new swimming pool area with a slide and children’s wet play station, and for those traveling with their pets an enclosed dog park for some off leash playtime. Getting around the World is convenient with the Magic Kingdom only a single boat ride away from the Fort Wilderness docks, and buses conveniently servicing any other location guests may desire. A visit to the Fort Wilderness campground today is a treat not to be missed even by those not staying on site or camping. Even casual visitors enjoy a walk along its shady streets where deer, rabbits and even armadillo are frequently spotted roaming freely to the delight of children and onlookers. Strolling through its trading post themed shopping areas you will discover specialty Disney merchandise that is unique only to Fort Wilderness. Visitors will also find the highly popular Hoop De Doo musical review at the settlement depot, a song and dance show reminiscent of the old west as a singing wait staff brings ribs, chicken, corn on the cob, and strawberry shortcake. Popular with the youngsters is the petting zoo and pony rides. Young and old alike enjoy looking through the horse barn, where you can see the large animals that pull the various wagons in parades and night time carriage rides and pictures of Disney’s animals through the years, including Walt himself in full cowboy regalia. Adjacent to the barn, blacksmiths and farriers can be watched shoeing the horses at the blacksmith’s barn. For the fitness inclined, there is a 1.5 mile round trip biking and jogging trail between the campground area and the wilderness hotel to allow you to work off all those calories from the all-you-care-to-eat buffet at the Trail’s End Restaurant! Nighttime in Fort Wilderness has an atmosphere all it’s own as you walk the softly lit pathways with the music of Pioneer Hall and the laughter of families wafting on the breeze. Beautiful horse drawn carriages pass you buy with their bells jingling as you wind your way to the beach for a mesmerizing view of Magic Kingdom fireworks across Bay Lake, followed by the Electric Light Water Show. A short moonlit walk back to your RV or cabin brings a perfect end to your day. 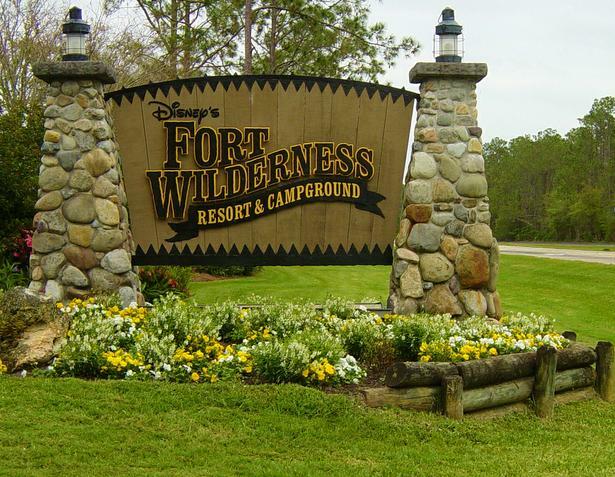 With so much to choose from, Fort Wilderness Resort and Campground is sure to have something for everyone! Just outside the Settlement Depot trading post along the path to the boat dock, you will find the infamous “lawn mower tree”; a tree that has grown completely around an old style hand powered grass mower left by a long since forgotten previous resident. The “Shoe” tree can be found along the shore of Bay Lake, at the end of the beach along the nature trail heading towards the Contemporary Hotel. The Cypress tree growing at the water’s edge is adorned with more than Spanish moss…dozens of pairs of shoes hang in the branches by their laces, rumored to be a tongue in cheek tradition of cast members finishing their work program there. Fishing is a popular and exciting pastime at Fort Wilderness. Bay Lake hosts fishing tournaments every year, and those staying in the campground have access to miles of shoreline and waterways for fishing on a catch and release basis. The Bike Barn, located behind the Meadows Trading Post, rents bicycles, canoes, golf carts, kayaks and 4 wheel Surreys. With miles of paved roads and waterways to enjoy them, a day or afternoon of good times are guaranteed. Each night beginning at 7:30 there is a campfire program hosted by Chip “N” Dale featuring s’mores, sing-a-longs, and rounded out with cartoons and a feature length film on the outdoor screen. A real WDW treat, it is offered free to guests. The Fort Wilderness Railroad ran from 1976 to 1980. Sinking tracks and safety concerns spelled its doom. After some years of rusting away, one car was restored and operated as a Pleasure Island ticket booth. The remaining cars and all four engines were acquired by members of the Carolwood Pacific Historical Society and found new life under their restoration. Walt Disney World’s first water park was neither Blizzard Beach nor Typhoon Lagoon. It was in fact River Country, a Fort Wilderness destination that opened in 1976 and was located behind the Settlement Depot. Disney history buffs will be thrilled to hear that the new pool renovation at Fort Wilderness features a slide built around a water tower that was an original fixture from River Country. What an amazing article. I also have visited Disney World for decades and yet you pointed out so many facts that I had no idea of. I really enjoyed your blog and am certainly look forward to your next posting. I love camping at Fort Wilderness. In fact, I will be camping there this fall. I will be there camping during the time of the Wine and Dine Marathon. Can’t wait because there are so many things to do and yet as relaxing a place as you would like to stay in if that’s your choice of acivity. 🙂 Couldn’t agree with the writer of this article more. Keep up the great articles, I look forward to reading , learning and relating to them. Thanks, Suz! I like your blog and you can feel free to re-blog anything on my site you’d like! If you have ever wanted to visit Disney’s Fort Wilderness, but were too concerned about the idea of camping on your vacation, then this article posted by Rod at WDW Mousenger is a must read for you. Fort Wilderness has long been on my Disney Bucket List ( ever since I saw a couple getting married on the grounds years ago, with none other then Mickey and Minnie as their witnesses ♥ ). Rod’s informative post has provided me with lots of great facts and tips I had never known or maybe considered before. Thanks for this great article Rod! Great article! FW was our home resort growing up! I learned to ride my bike on the Big Bear Little Bear loop! Can’t wait to go back! It’s been so long since I have stayed there! Thanks! I love it there. My daughter learned to ride her bike with no training wheels in front of Crockett’s Tavern and the playground. Enjoy! Now time for them to do something like this at Disneyland!